This beautiful Kyanite stone is so elegant in its beautiful steling silver embellishment. Focal is sculpted with my bow like design and very modern looking. 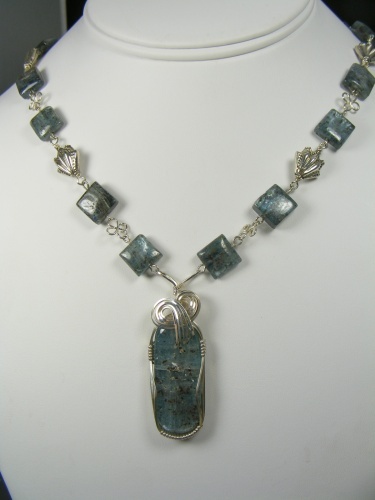 The necklace part is made of small kyanite stones with 4 leaf clover look alikes in between the stones and a few bali sterling siver beads to enhance the necklace. Piece measures 17". Clasp is a secure locking clasp with a small matching stone on it.